We’d love your help. 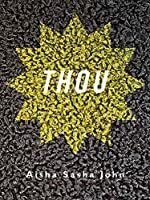 Let us know what’s wrong with this preview of Thou by Aisha Sasha John. To ask other readers questions about Thou, please sign up. Best book I've read in a long time. In I and Thou Hasidic thinker Martin Buber describes a way of relating to other people (& so the divine) that he divides into two modes: I-Thou & I-It. In the I-Thou mode, you approach the other as a being with existence separate and distinct from you and engage with them as such. The I-It relationship is something more akin to interacting with someone as though they were an object. Buber argues people act in both modes depending on the context of the moment, but no one ever acts in only In I and Thou Hasidic thinker Martin Buber describes a way of relating to other people (& so the divine) that he divides into two modes: I-Thou & I-It. In the I-Thou mode, you approach the other as a being with existence separate and distinct from you and engage with them as such. The I-It relationship is something more akin to interacting with someone as though they were an object. Buber argues people act in both modes depending on the context of the moment, but no one ever acts in only one mode throughout their life. I know what you're thinking. The Buber book is called I and Thou and Aisha Sasha John's book is called Thou. That's a pretty shaky comparison. I totally agree. I won't lie, I did initially think it may be the case when I saw the title, & the fact the collection is broken up into two parts: Physical & The Book of You. That sounded pretty Buberish. Pretty quickly, John disabused me of any links to Buber I had dreamt up. The speaker's voice in Thou is almost uncomfortably close, making the reader party to a long list of thoughts, feelings, physical functions, hopes & fears. At the same time, the speaker holds the reader back, hiding themselves in ways recognizable only by sudden voids and breaks in thought that signal something else behind the poem, something inaccessible. Whenever a "you" does come up, it is a blank other that the speaker tries to connect with, but any connection that can be made seems to vanish in a few pages. None of this speaks particularly to an I-Thou relationship. Until one poem in the second part of the book in which the speaker goes beyond the glib occasional "dear reader" moments we've seen before to directly the engage with the reader. "Reader, that I put a kiss on your face in the middle." ends with the lines: "Reader that I've had you / that you've / known me." Suddenly, I realized that I had been looking at what this collection tries to do all wrong. I was bringing some romantic notion to it that dictated that "thou" had to refer to some adored other when the speaker had been Thou all along, and I the unwitting I. The very impressionable, bawdy scenes of Aisha Sasha John's work left me hacking sometimes, laughing at others, and generally dissatisfied with the writing. At first, I thought I tasted some Bukowski, but it isn't bitter enough, nor as real, and yet, I, dumbfounded at the mundanity of most of the poetry, continued on hoping for more. I was wrong. If it weren't for the personal sensitivities and illustrations of trauma funneled through a caption of bite-size poems, I'd drop the book, but there so The very impressionable, bawdy scenes of Aisha Sasha John's work left me hacking sometimes, laughing at others, and generally dissatisfied with the writing. At first, I thought I tasted some Bukowski, but it isn't bitter enough, nor as real, and yet, I, dumbfounded at the mundanity of most of the poetry, continued on hoping for more. I was wrong. than I do for a similar lack. This review has been hidden because it contains spoilers. To view it, click here. it was physical. it was dizzy. it was uncanny how similar her experience of morocco was to rachel's (& maybe a bit to mine). it was funny. it was like belching for three years when somebody asks you what you're going to do with your life. it was poetry because who doesn't like poetry. Aisha Sasha John is a dance improviser and poet. She was born in Montreal, but spent most of her childhood in Vancouver, and currently lives in Toronto. John has a BA in African Studies and Semiotics from the University of Toronto and an MFA in Creative Writing from the University of Guelph. Her first book, The Shining Material, was published by BookThug in 2011. (from http://elevenelevenjournal.co Aisha Sasha John is a dance improviser and poet. She was born in Montreal, but spent most of her childhood in Vancouver, and currently lives in Toronto. John has a BA in African Studies and Semiotics from the University of Toronto and an MFA in Creative Writing from the University of Guelph. Her first book, The Shining Material, was published by BookThug in 2011.